One of my new year's resolutions is to eat less meat and more fish, so I've been eating a lot of sushi lately. @WeHeartHawaii and I met at Honolulu Sushi for lunch. It's a small eatery located in the same building as Like Like Drive Inn on Keeaumoku Street. We thought parking might be a problem since Like Like Drive Inn is a popular eatery, but surprisingly there was a lot of parking available in the parking lot. The menu is on the wall - the pictures are very helpful when deciding what to order. I opted for the salmon nigiri bento which came with four pieces of salmon nigiri, a tekka maki role (ahi), and three pieces of spicy tuna roll. Since I do not like spicy foods, I asked if they could sub the spicy ahi roll with something else, and they accommodated my request by giving me three pieces of California roll instead. 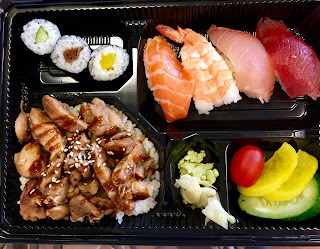 @WeHeartHawaii ordered the teriyaki chicken bento which came with teriyaki chicken over rice, four pieces of nigiri, and three pieces of sushi (cucumber, daikon and one other). The prices were very reasonable for what we got - decent quality sushi. It wasn't extraordinary, but it was great for a quick weekday lunch and the lady who worked there was very friendly (she even gave us complimentary miso soup to go with our bentos).